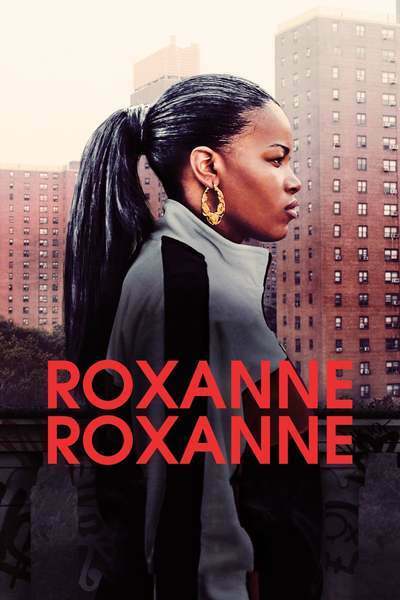 “Roxanne Roxanne” tells the story of trailblazing rapper Roxanne Shante, a young woman from Queens in the 1980s with impeccable flow, which made for hits like “Roxanne’s Revenge.” But writer/director Michael Larnell takes a different approach to the story, framing her first and foremost as an independent woman who tried to resist the sinister nature of the streets, while being brought down by many cowardly, controlling men throughout her life. It’s a powerful idea given the emotional truth to her tale, but it ends up hindering the story as it tells a true story that’s heavy with its themes but abridged at best. It’s a very interesting angle at first, and makes for a strong, peppy first act: we see Shante (Chante Adams) as a daughter and older sister in Queensbridge, juggle school, family, and money-making while dealing with the negative influences around her. Her rapping abilities are a secret at this point in the story, only hinted at as a weapon of emasculation. It’s more about Shante’s family, including mother Peggy (Nia Long), who has been saving up money to move them to New Jersey, where Shante’s young sister can play in a backyard. But when Peggy’s boyfriend runs away with the money, and other men start to take advantage of the her and Shante, a chorus begins to emerge, loud and effective: these men are undoubtedly trash, and there's no end to them. Since that idea was so prominent in a career that she essentially retired from at the age of 25, it would hit harder if the story about Shante’s days as a rapper had better rhythm. Instead, after Shante gets her big break by recording a song in one take for a friend (taking on the identity of the UTFO song “Roxanne, Roxanne”), her music arc never takes off. There are too-brief references to her accomplishments, or other rappers making diss records about her, and there’s no sense of the shape of her success at any given time. The film works with a small budget by restricting the number of performing scenes, but those are moments in which it pops most, even when it shoehorns historical figures like a beatboxer named Biz Markie. But the music career becomes another example of how Larnell gets in the way, concerned most of all with blunt feminism than the rich story that supports it overall. When Roxanne gets screwed over by another disrespectful man on her tour who disappears with her cut, it’s a frustrating moment gravely undermined by our confusion about the very tour being discussed. The quality of “Roxanne Roxanne” is scattered throughout, most prominent in its performances. Adams is undoubtedly and effectively raw as Shante, articulating the equal-sized strengths and vulnerabilities of someone who can hold her own but still believes in some people; Long gives a strong idea of how a woman could feel so supported by a man and then defeated when they show their true colors, but her power dissipates and is simplified not long after Shante’s career takes off. And in the movie’s world of straight-up awful men, Mahershala Ali offers the most interesting variation, as someone with a gentle presence that only masks the awfulness that Shante later experiences when he starts to take ownership of her. The irony to the narrative being so chopped up is that the filmmaking does have great moments of editing, showing that Larnell's visual eye can be uniquely inspired. His greatest artistic stroke involves a close-up of Shante’s face in the ecstasy of the bedroom, as then matched with her screaming as if going to labor, which is then matched with her being dragged up MA, showing the passage of time and an emotional arc about their relationship. I remember being wowed by it when I saw this film at Sundance back in 2017, and it’s still one of the most effective usages of concise visual storytelling I’ve seen since. While “Roxanne Roxanne” doesn’t follow the way of a typical music biopic, it does bring to mind another manmade mess, David O. Russell’s “Joy,” about the woman who invented the Miracle Mop. Both of these feminist stories have such reverence for their center subjects, but such a flat idea of their respective worlds, the people in them, and the great things these women did. In the case of “Roxanne Roxanne,” it seems progressively revealing that she’s introduced from the very beginning as the greatest rapper, with Larnell consistently overlooking her hours of hard work in favor of elevating her for what she means, instead of the grounded nature of who she is. Like "Joy," this story feels overwhelmingly like the writer/director's version of their subject's lives, rendering "Roxanne Roxanne" a portrait that's as expressive as it is incomplete.